Standard Size Chrome Postcard in Very Good, Unused Condition. This post card was published by Richard Koontz of Vermilion, Ohio. 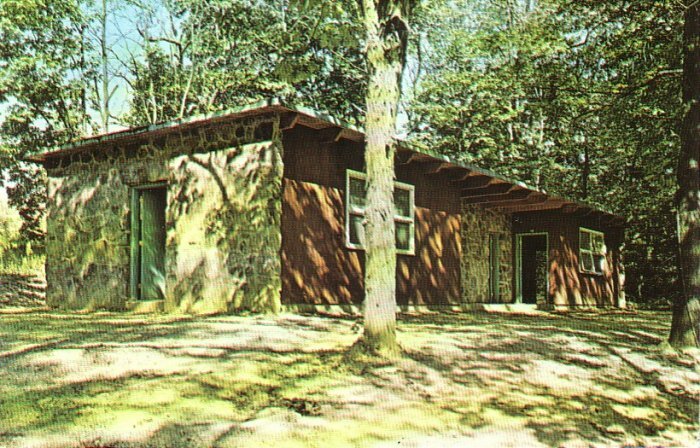 One of the Native Stone Cabins at Beautiful Pilgrim Hills, the Conference and Retreat Center of the Ohio Conference of the Congregational Christain Churches. All items we sell come from a non-smoking home and are stored with loving care until they can be sent to their new owners. Scanning is 150% larger than actual card at 100 PPI resolution so you can see all the creases, bumps, bruises and warts. Wavy lines on chrome postcards are from my scanner and NOT on the actual card. We go the extra mile in protecting your postcard. Your card is shipped in a rigid postcard holder, surrounded by card stock and posted with metered mail so minimum handling is needed by the post office. We are happy to accept returns if notified within 14 days of receipt of the item, no questions asked! The item must be returned in the same condition as when shipped and buyer responsible for return postage.